America Magazine has published an incredible article by Patrick Houlihan about Pope Benedict XV’s efforts 100 years ago to broker a peaceful solution to WW I. In many messages, beginning in September of 1914, he addressed the war, calling it, a horrendous bloodbath which dishonors Europe, the suicide of civilized Europe, the darkest tragedy of human hatred and human madness, and a useless massacre. Houlihan rightly refers to Pope Benedict XV as the most (unjustly) forgotten Pope of the 20th century. Here is his article in its entirety, rightly giving praise to this Pope’s holy efforts to end the war. A century ago, during the slaughter of World War I, came a prominent call for world peace. Pope Benedict XV dated his Peace Note on Aug. 1, 1917, and it became the most famous episode of a pope unjustly forgotten today. The document, published in French and Italian to reflect the languages of early 20th-century church diplomacy, was distributed to the governments of the warring powers. Benedict’s effort was one of the war’s most concrete attempts to end the fighting, but it was later overshadowed by President Woodrow Wilson’s Fourteen Points. Wilson used ideas from the pope’s August 1917 Peace Note, though the president was not keen to acknowledge it. 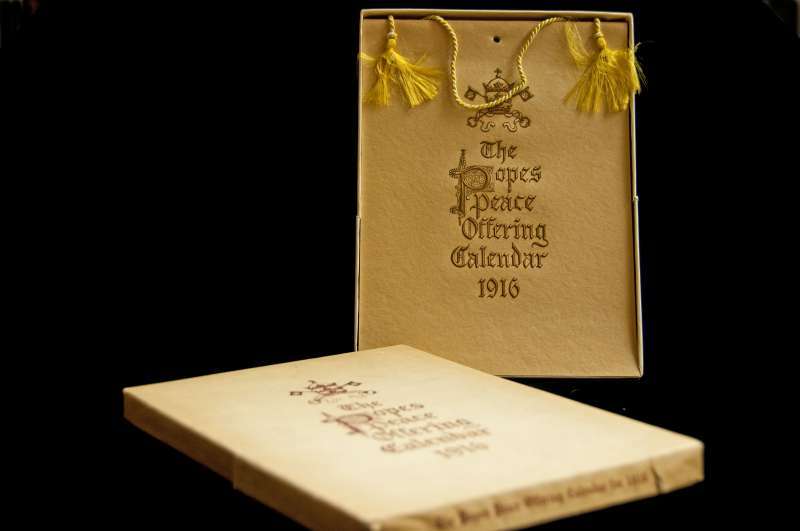 Especially since the war continued, some might consider the 1917 papal Peace Note a failure, highlighting the supposed weakness of religion in an era of brutal realpolitik. However, the Peace Note was an idealistic yet practical effort to make a better world, and it had delayed successes. It was a key symbol of Benedict’s papacy: Surrounded by war, he strove for peace for the global community. Overshadowed in his lifetime, he nonetheless provided lessons for the world’s peoples and policymakers, then and now. 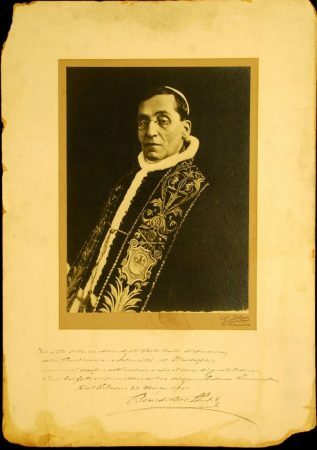 Benedict XV’s papacy lasted from 1914 until his death in 1922, taking place during the new horrors of modern war. The church strove to adapt to the world of poison gas, aerial bombardment and unrestricted submarine warfare. Nevertheless, Pope Benedict XV remains the “unknown pope,” in the words of his English-language biographer, the Cambridge historian John Pollard. Why is Pope Benedict XV so relatively unknown? Besides his marginalization by leading politicians of his era, part of the answer must be that his world existed before the invention of radio and television that could reach global audiences. Additionally, Benedict’s reserved, unassuming demeanour would not seem to measure up to the out sized personalities of modern popes including Pius XI and Pius XII, shaped by their struggles with communism and fascism, and the two new canonized popes, John XXIII and John Paul II, who adapted the church to the new realities of globalized politics. In the Great War’s opening stages, Benedict called on the belligerent powers to end the conflict, notably in his first encyclical, “Ad Beatissimi,” published on Nov. 1, 1914, but statesmen disregarded his pleas. A major reason was that each side believed Benedict to be an agent favoring the enemy. Disregarded by both warring sides and de-territorialized for the first time since antiquity, the Holy See had an ambiguous diplomatic position that ironically allowed Benedict to maneuver the church toward more humanitarian concerns beyond the politics of nation-states. A more reactionary pope such as his predecessors—Pius IX and St. Pius X—might have turned inward and backward, nursing a grievance as a continued “prisoner of the Vatican,” in reference to the confiscation of the Papal States during Italy’s unification in the 19th century. Such a pope might have fulminated about the supposed sins of modernity, rationalized that the powers deserved their horrible fate and refused to intervene. Instead, Benedict tried to end the suffering, reaching outward and looking forward. His engagement with the humanitarian crisis of the day was a model of progressive leadership. Many had called for an end to the Great War, but Benedict’s Peace Note was remarkable for its attempt to engage both sides on a number of practical points that would substantively advance the cause of peace. In the Vatican Archives, one can see multiple drafts of the note, including some with the pope’s handwriting, showing the considerable care that went into the document’s composition. There were six main aims of the Peace Note: 1) simultaneous, reciprocal reduction of armaments; 2) international arbitration; 3) “true freedom and community of the seas”; 4) reciprocal renunciation of war indemnities; 5) reciprocal evacuation and restoration of all occupied territories; and 6) an examination “with conciliatory spirit” of contentious territorial claims. Benedict’s desire for peace resonated with most of the global population, but the reactions from the leaders of Great Powers were not enthusiastic. The final two points concerning territory highlighted the main reasons why the 1917 Peace Note failed, as the opposing sides refused to budge. The Peace Note explicitly mentioned territory in Belgium, northern France, German colonies, Italy and Austria. However, the German high command, dominated by the military dictatorship of Paul von Hindenburg and Erich Ludendorff, refused to give up territory in Belgium. As the symbolic focus of German aggression, Belgium was a key moral sticking point. France and Britain would not consider peace plans before German soldiers withdrew from Belgium and France. The United States had entered the war in April 1917, and President Wilson was becoming the dominant voice of a new moral force in the world order. He would not brook a challenge to his leadership from Pope Benedict. Wilson came out against the pope’s peace proposals, arguing that the present rulers of Germany could not be trusted. Nevertheless, just a few months later in his famous Fourteen Points of January 1918, Wilson incorporated much of the substance of Benedict’s Peace Note. When the German military leadership realized it had lost the war, the Central Powers tried to end the conflict by accepting an armistice on the terms of Wilson’s Fourteen Points. Later, many in Germany grumbled that the eventual Versailles Treaty was a harsh result of bait-and-switch diplomacy. Nevertheless, Benedict played a delayed role in bringing about the Armistice of November 1918. The Great Powers met in Paris in 1919 to formulate peace and make terms for accepting the defeated powers back into the community of nations. They ended up planning a new world order that caused grievances culminating in the even more destructive World War II. Benedict’s Peace Note had foreseen some of these difficulties, looking both forward and backward to the problems of historical nationhood. The note mentioned the war’s proximate territorial and political cause, the Balkan States, though without specifying which states Benedict meant or where those borders lay. Highlighting 20th-century tragedies in progress, the Peace Note also mentioned Armenia and the “noble historical traditions and the sufferings sustained” by the kingdom of Poland. Benedict had personally lobbied the Ottoman Sultan Mehmed V, attempting to halt the unfolding genocide of the Armenians. During and after the war, Benedict XV would also advocate on behalf of starving children in East-Central Europe. Unlike the statesmen who had to hash out the new state boundaries at Paris in 1919, Benedict enjoyed the moral luxury of not being responsible for political decisions. The pope had wanted to be at the Paris Peace Conference. However,in the secret Treaty of London in 1915, Italy, with the “Roman question” still a sensitive political point, had forbidden the Allies to consider the papacy in such negotiations. The Holy See would also be excluded from the League of Nations, the precursor to the United Nations. This was a blessing in disguise. Benedict escaped the insoluble dilemmas of political boundary demarcation that caused bitter enmity leading to ethnic cleansing and genocide in World War II. At crucial moments during and after World War I, stripped of territory and outside of political alliances, Benedict focused the church on humanitarian concerns across the globe—explicitly calling for people to help each other beyond affiliation of nation or religion. Despite the apparent failures of his peace overtures at the level of high diplomacy, Benedict’s actions kept pace with his ideals. His humanitarianism extended to those most ravaged by war: widows, orphans, displaced persons, refugees and prisoners of war. In 1915, he founded the Opera dei Prigionieri (Prisoners’ Works Office), which had offices in the Vatican under the auspices of the secretary of state and became a key focus of Vatican foreign policy. The office helped people find information about their loved ones in a time when communications channels were difficult. Regarding spending in service of his humanitarianism, Benedict was generous to the point of profligacy. During wartime deprivation, when money was scarce all over the world, Benedict nearly bankrupted the Vatican’s liquidity, giving away 82 million lire to people in desperate need. The Vatican archives highlight the range of responses from around the world: letters from poor people in dire straits, as well as powerful organizations seeking to reform the world. His tireless advocacy generated practical connections with nongovernmental organizations such as the Red Cross and the Save the Children Fund. His example inspired individual activists such as Marc Sangnier, who experienced the horrors of war and tried to forge transnational bonds of solidarity between former enemies. Benedict’s desire for peace resulted in a multilevel model of engagement with leading politicians as well as grass-roots efforts. Not limited to Catholic circles, his indirect influence would radiate to the League of Nations as well as thinkers who would later become important politicians responsible for the Christian Democratic Parties of post-1945 Europe. His 1919 apostolic letter “Maximum Illud,” on global missions, argued for an equal leadership role for indigenous clergy, pointing the way toward a truly global church. One must not overly romanticize Benedict XV or give an uncritical account of his influence on the modern world. For instance, the Code of Canon Law was completed in 1917 during Benedict’s reign and lasted until 1983; it centralized hierarchical power structures and solidified lines of authority within the church. In some ways, Benedict’s apolitical humanitarianism was a brief moment that soon evaporated after his death—certainly by 1929, when the Vatican made the Lateran Treaty with Benito Mussolini’s fascist Italy. Faced with the developing threats of communism and Nazism in the interwar period, the leaders of the Catholic Church made alliances with authoritarian powers—and, some would say, dealt with the devil. The religious world that Pope Benedict XV inhabited needs further historical study. The apparent failure of his August 1917 Peace Note only highlights that humanitarian peace-making goes far beyond high-level diplomacy. It is an ongoing process taking place globally among masses of people. In many key ways, this process accelerated during World War I. The world needs a more thorough examination of the ideals and tangible effects of religious institutions to understand how modern war affects the hearts, minds and bodies of everyday people. Benedict XV’s papacy was a shining example of humanitarian advocacy both above and below the messy, necessary level of high diplomacy. In our time, when politicians clamor for the quick soundbite (or tweet), true leadership inspires through personal humility and dedication to serve the deepest existential needs of others. There was much “useless slaughter” in the First World War, as Pope Benedict XV wrote, and this view dominates contemporary reporting on war and conflict. But when faced with this seemingly endless cycle of graphic violence and bitter politics, one must not abandon hope. Rather than fixating on apparently meaningless disasters, one can look to the many people who are helping their fellow human beings, trying to make things better. There are countless untold stories of human decency behind the scenes. The struggle for global peace continues. Patrick J. HoulihanPatrick J. Houlihan is a research fellow in the Faculty of History at the University of Oxford and the author of Catholicism and the Great War: Religion and Everyday Life in Germany and Austria-Hungary, 1914-1922. He is a member of Oxford’s “Globalising and Localising the Great War” project, funded by the Arts and Humanities Research Council of the United Kingdom.